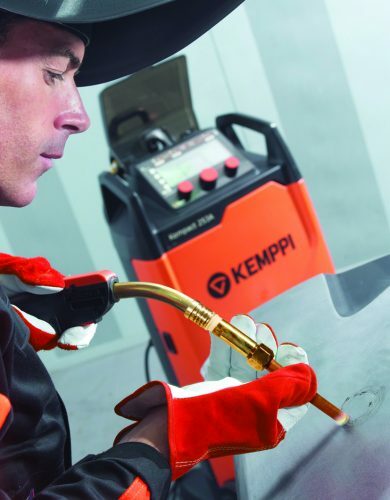 Leading international welding equipment manufacturer, Kemppi, has developed two welding machines designed specifically for the modern mechanic and smash repairer workshop. a robust, portable and easy to use design with advanced, functional features that make welding hassle-free, quick and high quality for the vehicle repairer. The purpose-built Kempact RA MIG/MAG welding equipment includes a unique function called the HotSpot that lets you repair small dents in vehicles with incredible ease. This innovative feature delivers a specialised heat treatment process. A simple point and pull the trigger function, HotSpot allows you to localise the heat to repair vehicle dents accurately and quickly. When the MIG gun’s trigger is pressed and the carbon electrode comes into contact with the work piece, an electrical circuit forms and the carbon heats the metal surface to help you pop the dent out. HotSpot makes metal shrinking both simple and convenient. HotSpot can also be used to release corroded nuts and bolts in chassis and mountings. Heat is applied to the bolt head using HotSpot until it is dull red, making it easy to remove. Designed with safety in mind, the HotSpot function is powered by electricity, not gas. This eliminates the possibility of gas leakages and allows you to work safely. The HotSpot function has 4 heat settings and comes as standard in all the Kempact RA models. Other Kempact RA must have features that are perfect for the modern mechanic and smash repairer workshop include the convenient waist height LCD control panel and easy parameter control, a parts tray and LED cabinet lighting. The Brights™ cabinet lighting allows easy wire loading in low light conditions, a WireLine™ service alert function signals routine wire-path maintenance needs, and the integrated GasMate™ chassis design makes gas cylinder loading and machine movement easy and safe. Available with 180 and 250 amp single-phase and 320 amp 3-phase power sources, users can choose from seven Kempact RA models and from either a Regular (R) or Adaptive (A) control panel interface. ‘The Kempact RA series effectively combines all the technology an automotive repairer needs in one very portable and compact package. With this range the repairer is always assured of an easy and excellent weld regardless of whether they are using mixed or CO2 shielding gas,’ said David Green, Managing Director of Kemppi Australia. 200 is very easy to use and manoeuvre, particularly for welding in hard to reach places in vehicles. The machine packs huge welding capacity and quality into its portable and compact size. Vehicle repairers can choose between Automatic or Manual mode set-up for precise welding quality and arc ignition, monitored and controlled by Kemppi’s adaptive arc regulation system. Very easy to use, the Automatic mode in the Minarc MIG EVO 200 allows you to simply set the plate thickness, weld shape and material type, and weld. There is no need for guesswork. Material selection for the Minarc MIG EVO 200 includes ferrous, stainless steel, aluminum and CuSi filler wires on either 1kg or 5kg spools. Also, each unit includes a 3-meter gun and carry strap. Both models deliver welding power from a 16 A supply. They also both have a large LCD graphical interface to guide you during set-up. The machines are designed to be used with long supply cables of 100m+ so you can weld anywhere. With the portable Kemppi Minarc MIG EVO 200 you can weld precisely, access hard to reach areas and wherever your work takes you.